Peaceful Lakefront !/Free WIFI/Wonderful Hot Tub! House, 3 Bedrooms + Loft, 2 Baths, (Sleeps 8), lake views from front & back! Welcome to a truly special lakefront experience on the shores of Deep Creek Lake. Located in a private community on a peninsula at the Northern end of the lake, our home offers peaceful relaxation far away from busy roads and traffic. Families with children or pets will especially appreciate the one lane road cul de sac location with no through traffic. 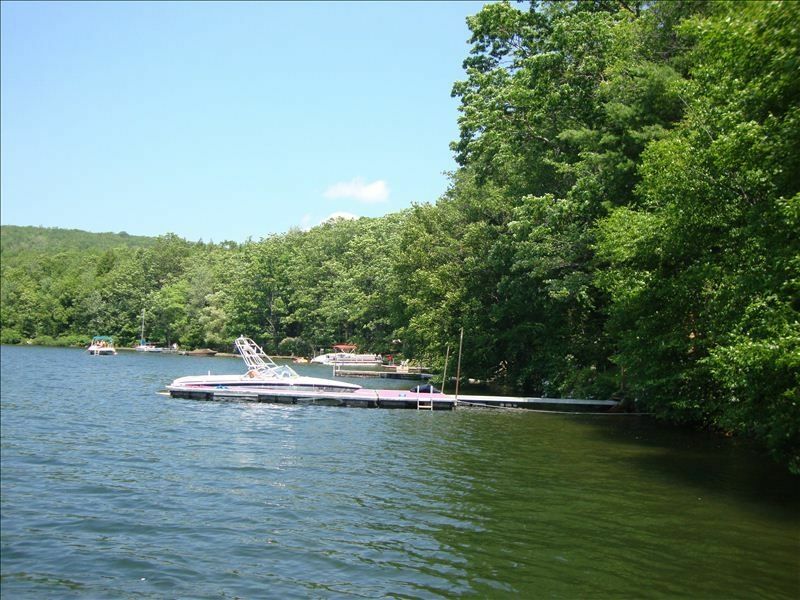 The property features almost 100 feet of western exposure lakefront in a quiet cove with a large private dock. The dock is ideal for relaxing on sunny days, fishing, or swimming. Sunsets are spectacular with sunshine lasting into the late summer evening hours. After sunset, you'll enjoy using the fire pit near the lakes edge. The house itself features a beautifully renovated kitchen and dining area with stainless steel appliances and maple cabinets. The house features a master bedroom with full bath, and two other bedrooms and a renovated hall bath, with beautiful ceramic tiles, new cabinetry and a jetted tub. The living room will evoke memories of classic lake lodges with its cathedral ceilings and stone fireplace and wonderful views of the secluded lakefront. For the ultimate in relaxation, there is an outdoor hot tub with a wonderful view of the lake. The house features a nice game room featuring a pool table, Cable TV, DVD, and reclining sofa and chair. Across the front of the house is a large deck where you will enjoy barbecuing on the gas grill, dining outdoors on the patio furniture, or relaxing on the swing, all with a beautiful view of the lakefront and yard. The house sleeps 8 people, offering 3 queen size beds, and a futon. We accept personal checks or money orders and require one half of the rent in advance to confirm the booking. Access to nearby restaurants, arcades, state parks, skiing, and whitewater rafting are a close drive away. Please note that from mid June through the end of August rentals are on a weekly basis. Check in is on Saturday and Check out the following Saturday. Partial week rentals are available at all other times of the year. Fire pit at the lake's edge for enjoying the outdoors on chilly nights. A great cabin on the lake. My wife and I stayed over the weekend and we were very impressed with the cabin and it owner. He kept me up to date with door lock info and his maintenance man if we have a problem. The cabin is in great shape. All modern appliances and updated kitchen. The rooms were all nice size. The bathrooms were all up to date and look brand new. I enjoyed the entertainment room with the pool table. We didn't use the hot tub, but I did check it out. Its the same model we have at home. Everything about the cabin was great,except for the weather. A nor'easter came in over the weekend and it rained the whole time. We didn't have much to do outdoors because of the wet weather, so we left a day earlier. You can't predict mother nature. But my wife and I would definitely rent this cabin again. Thanks Rob. Very comfortable home, and well equipped! The location is ideal, nestled on a quiet cove. Enjoyed watching the sunsets from the dock! The host was wonderful to work with; even extended our check out time! My family had a great time, and we would definitely return to this house! House was immaculate, updated, with a perfect location on a quiet part of the lake. Grounds are lovely and the hot tub was a welcome addition. Our Golden loved the water and jumping off the dock! We thoroughly enjoyed our week spent at this home on this beautiful cove. The game room gave us a lot of space to spread out with our granddaughter, and just plain hang outl Especially since it was a little bit of a rainy week. My only comments on making it better would be better lighting in the master bathroom. Also the wi-fi was sporadic and cellular connection is weak throughout the Deep Creek Lake- just plan ahead! Thank you for your well-stocked and comfortable home! My family and I had a wonderful time on our vacation and most of it was due to the location of this home, the amenities here and the support we received when needed. The site of this home was wonderfully located on a quite peninsula on a cove near the dam. My boys loved being able to jump into the lake off the private dock and then warming up in the hot tub. The fire pit was put to good use as well! We had a minor hiccup with the prior renters leaving the grill a mess but Rob was very helpful in getting that cleaned up so we could use it. We could smell the "rotten" smell that came from the faucet in the master bathroom but it was not as overwhelming as others mentioned. Just chalk it up to well water charm. I would consider staying here again in a heart beat!! I miss is all ready! We had 3 generations staying in the house. The pool table, hot tub and lake activities occupied the 20 somethings. The fire pit, lawn swing and peacefulness were perfect for my 86 year old parents. The kitchen is well stocked, complete with crockpot and blender. Nearby we enjoyed a visit to a lavendar farm, white water rafting and hiking to a waterfall in the state park.